After just completing my second trip to La Mesa de Los Santos (La Mojarra), I was reminded of what makes this place so great. I was blown away by the hospitality shown by the staff, the friendly people and the overwhelming beauty of the surroundings. It is somewhere that will keep me coming back for a long time. 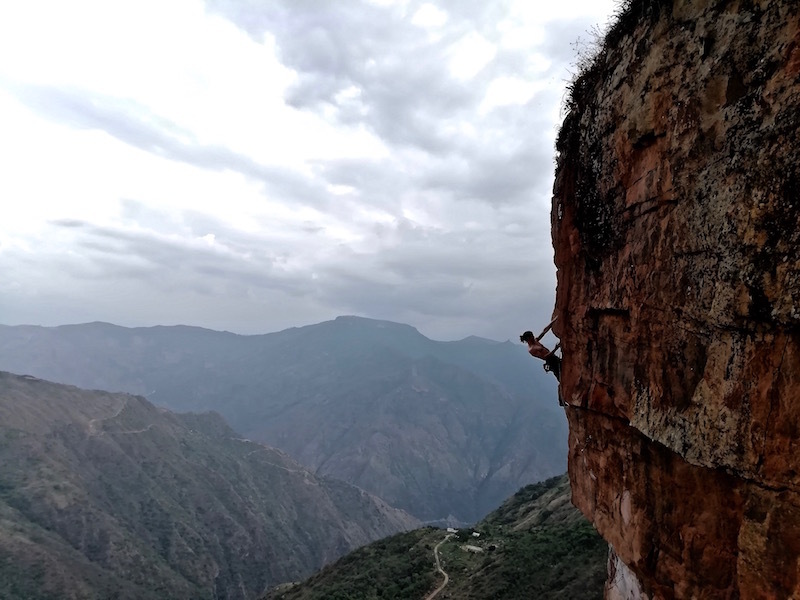 Through the hard work of the climbing community and owners of El Refugio (the local hostel), Richie and Alexandrea, La Mojarra has quickly risen from obscurity with only a handful of routes to becoming the second largest climbing destination in Colombia by number of routes, only behind Suesca. The first routes started getting put in by a few dedicated locals about 15 years ago. Over time, El Refugio and the quantity of climbs grew. Now there are close to 300 routes spread across more than 20 sectors. Though Colombia isn’t considered an international climbing destination, that is slowly starting to change. In 2015 Pros Mason Earle and Katie Lambert took a trip down. 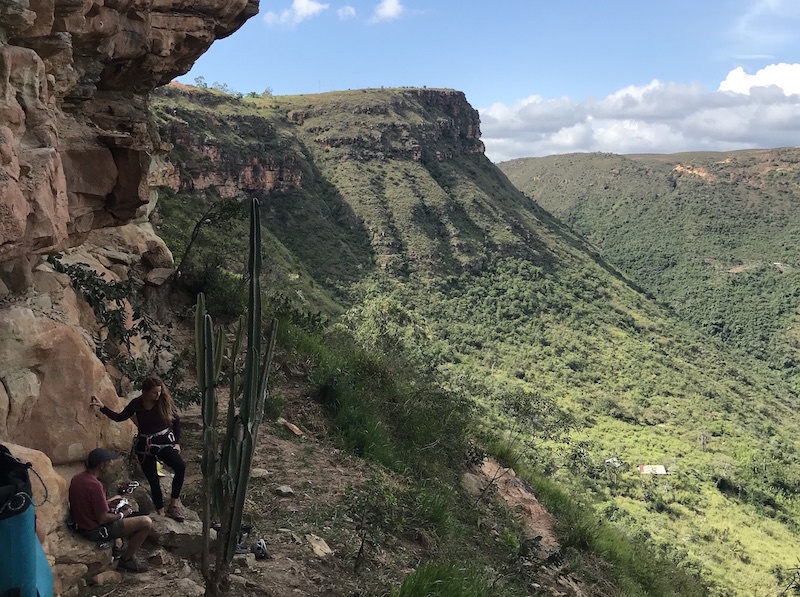 That trip and the overall rise of climbing’s popularity has put La Mojarra on the map as a climbing destination. 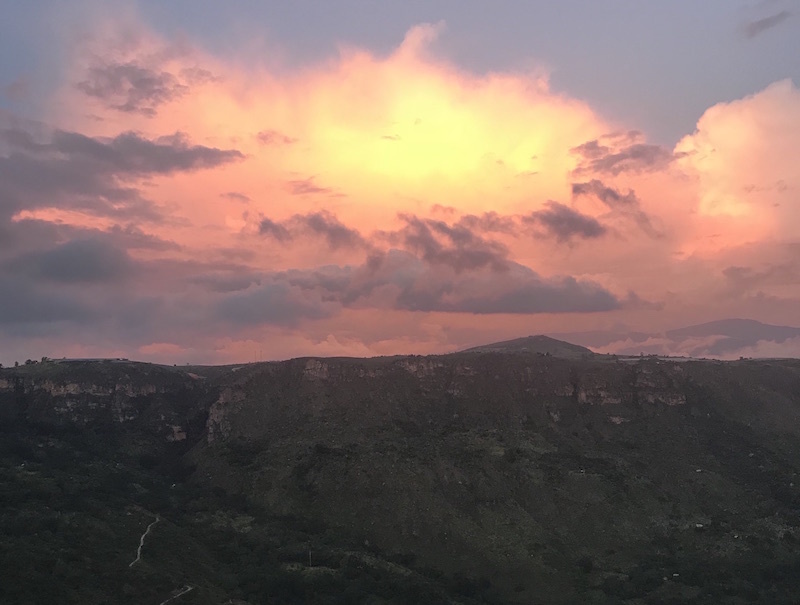 While Suesca is an “old-school” crag in almost every sense, La Mojarra comes at a refreshing contrast. The grades are much more normalized to what you might find in the USA, the bolts are close together, and the routes are generally short and steep. If you’ve never climbed before, this place is much friendlier to start as compared to Suesca. This location has more beginner grades which are easily accessible. You can also hire a guide if you are in need of some lessons. 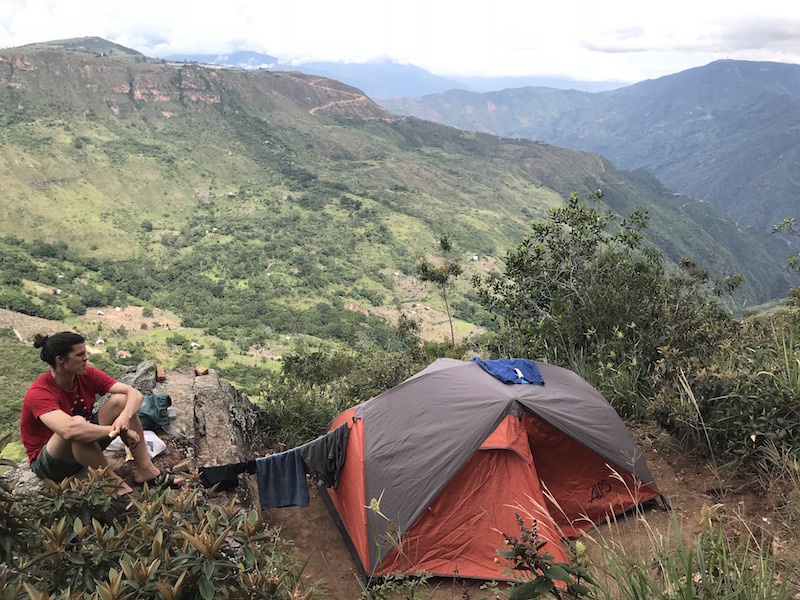 If you’re a solo traveler, this is a great place to post up to find partners, as almost everyone staying at El Refugio is a climber. 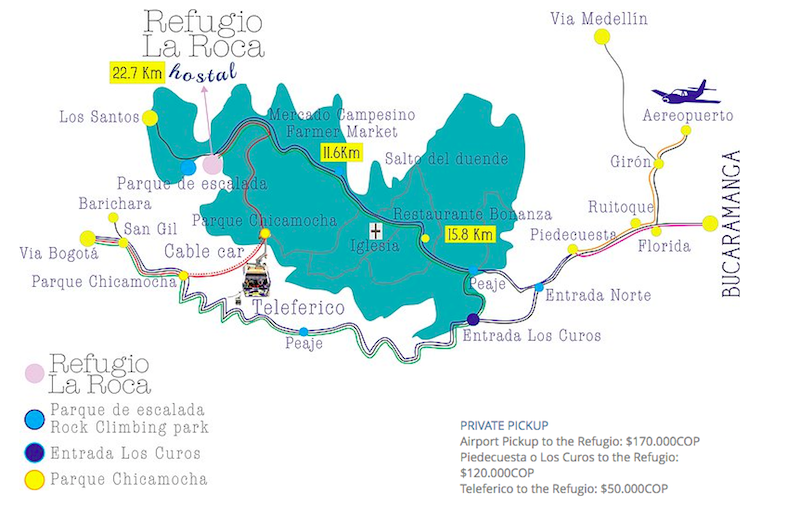 Nearby are a few hostels where you can either pay for a bed or camp, but the only real option is Refugio la Roca. It is the closest and, by far, the most popular place to stay. A high percentage of its clientele are climbers, so it is the spot to go if you’re looking for a partner or someone to hang out with. Important to note, El Refugio owns the access rights to the climbing, so your entrance is free only if you stay there! They offer dorm rooms, private bungalows, and camping. You will have access to the kitchen facilities, bathroom, restaurant, shop, and common room areas. A new building of dorm rooms was finished in 2017 and the rooms are nice and comfy. A new kitchen was also installed, but keep in mind that unless you bring your own pots and pans you will have to rent kitchen supplies at a cost of 1,000COP per day, per person. 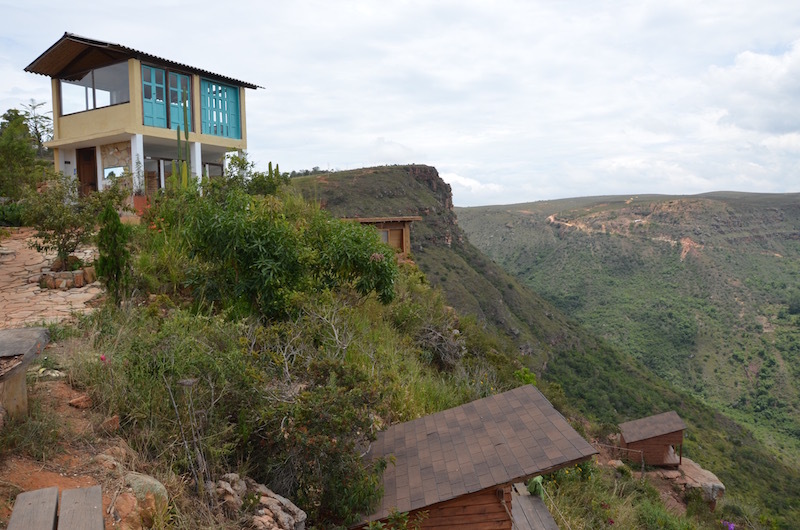 If you’re looking for a more secluded option, there are private bungalows available and camping. The camping costs 20,000COP per night, per person. The camping was recently moved so that it is about a 5-8min walk from El Refugio. The new space is beautiful and quiet. The hostel has WiFi, a bar/restaurant (which has excellent food), daily fresh baked bread (I highly suggest the chocolate bread), and ample hangout space. Why we’re all here in the first place. The climbing here is excellent. In my experience, the best in Colombia. Machetá/Suesca are the only places that might be able to challenge that claim, but I think a lot of people would agree with me on this one. The rock is high quality, heavily featured sandstone. There is a mix of styles, but most of the routes are slightly to very overhung, with a lot of explosive bouldery moves. Super fun to climb. The bolting has all been done to a high professional quality, and due to the dry desert conditions, you don’t really have to worry much about rust. All bolts are stainless or titanium glue-ins. Here are a few classics to get you started. High quality routes are marked with a yellow star in the guidebook. Just start climbing these and you won’t be disappointed. Pulse (5.11a, Zone 2) – Follows up a crack feature all the way to the top. Very good. Gozo Poderoso (5.11a, Zone 2) – Another nice 5.11a, this requires a bit of technique as you follow the small dihedral feature. Fuego en la Proa (5.13a, Zone 4) – Spectacular route, starts out thin and technical, ends with a roof and a relentless pumpfest. A Ultima Hora (5.11d, Zone 4) – A very technical climb, requiring the use of small feet, smearing and stemming the whole way up. Musica Para Camaleones (5.9, Zone 9) – I’d have to say the best 5.9 here. The crux is the first move. Portal Rolo (5.11c, Zone 10) – Good, clean, vertical fun (and super soft for the grade!!). Entre Canibales (5.11b, Zone 11) – Great exposure on vertical crimps. Almost Every Climb in Zone 12, 14 and 15. El Dientes de Oro (5.12a, Zone 17) – Out of this world exposure, a must climb. One of the best in the park. There are a number of ways to arrive at this location. The closest major town is Bucaramunga where there is an airport and a bus station that can take you anywhere in Colombia. 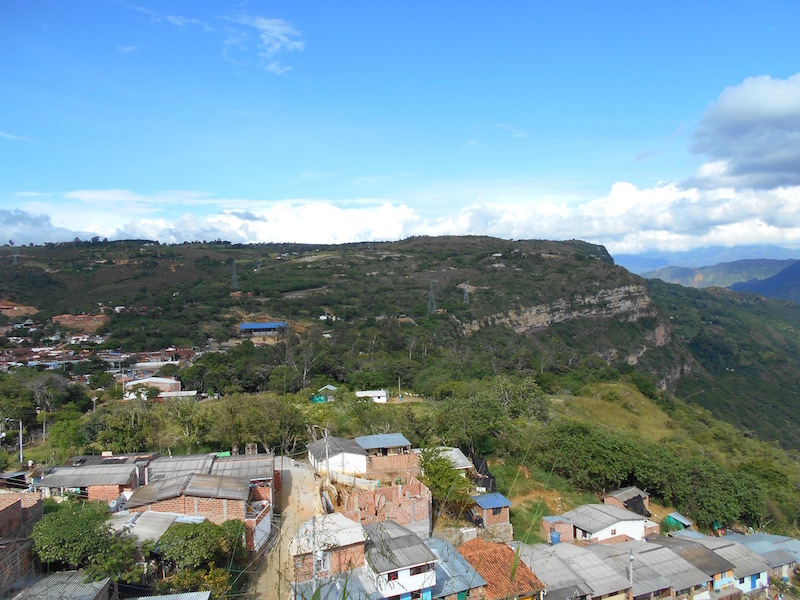 From Bucaramunga, take a bus or cab to the town of Pidecuesta. If you are coming from the airport I suggest taking a cab to Pidecuesta as the buses to arrive are a mess (the cost from the airport to Pidecusta is 30,000-35,000COP). Head to Transport La Culona bus station and take the bus heading to “Los Santos.” The buses leave every hour until about 6pm at night. From Piedecuesta it will take 1.5-2 hours to arrive at your destination. You’ll have to tell the bus driver where to get off. He might know where El Refugio is if you’re lucky. The exact point on Googlemaps is here. In the event that you miss the stop, Los Santos is only about 15 minutes further down the road and busses run about every 30 minutes, so you could quickly take a return bus. If you’re coming from Bogota, you can either get off in Pidecuesta and then backtrack a bit towards the Refugio, or tell the driver to let you off at entrada Los Curos, which is about 12km before Pidecuesta. From Los Curos you can wave a bus down which will take you towards Los Santos. 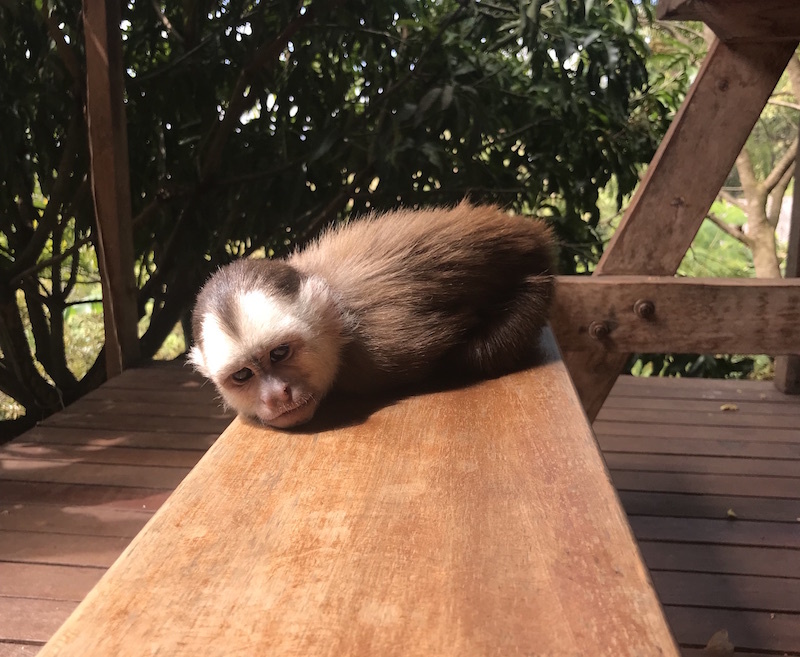 Did I Mention That they Have a Monkey? Since Colombia sits near the equator, there aren’t really proper “seasons” like there are in North America or Europe. The “dry” or “high” season is December to February, which is characterized by slightly lower temperatures and less rainfall. However, the climbing here is year round, so I wouldn’t worry too much about the season. The rocks will be dry the following day after almost any rain event. The crag shares the same eastern exposure, meaning that you have to wait to the afternoon anyways to escape the heat. After very heavy rain, it can sometimes be humid, but compared to some destinations like Tonsai or Cat Ba, the temps here are nearly perfect. El Refugio has a restaurant which serves food all day. They provide free coffee in the mornings as well. I really like the food here, especially the breakfasts and the fresh cooked bread. If you’re on a budget, there are a number of small, family-owned shops nearby that you can walk to and buy food if you wish to cook for yourself. The water isn’t drinkable, so you’ll want to stock up at the stores (a water bag of 5L costs 2,000COP). For beer and packaged goods, go here. For fresh fruit and veggies, walk down the road, and after 2 minutes, you’ll see a sign reading fruit and veggies for sale. Enter the gate, and go around the back of the house. If you’re really looking to save pennies, I suggest buying supplies in Pidecuesta or Los Santos, as the prices at the nearby aforementioned tiendas (especially the veggies) are slightly elevated. Keep in mind that these stores are cash only, so make sure to stock up before you arrive. The nearest ATM from El Refugio is in the town of Los Santos, which is about and hour walk or a 15 minute bus ride. Here you can also find restaurants, Wifi and more supplies if you wish. It is worth mentioning that El Refugio now accepts credit cards. If you need to buy or rent gear, El Refugio has a small shop. The prices for rental are a bit high, but if you’re only planning on climbing for a day or two this is probably your best option. Despite our best efforts, we can’t climb every day. But there are a few fun things to do nearby on your days off. Cafe Mesa de Los Santos (rated the second best coffee in Colombia!) is located about a 20 min bus ride from the hostel. You can go sample the coffee any day of the week at the Café Mesa de Los Santos. 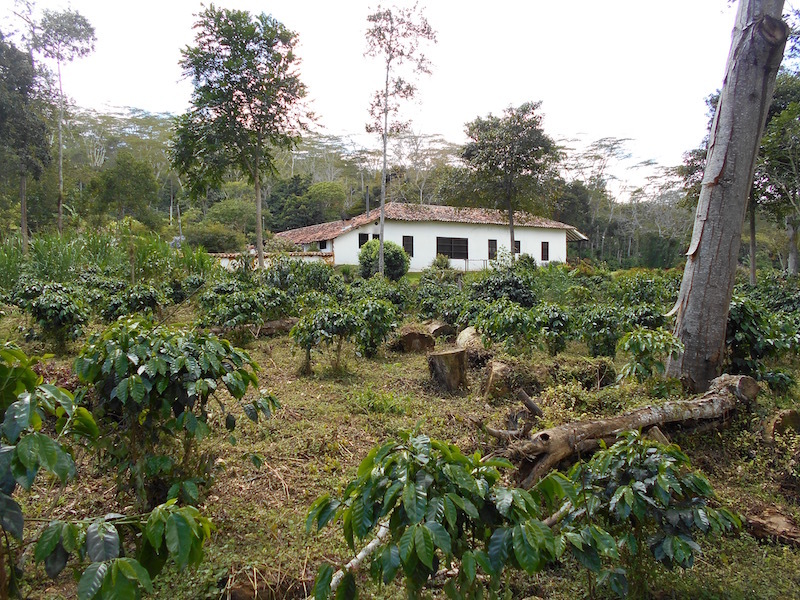 If you want to take a coffee tour, you can go to Hacienda El Roble. This is about a 5-10min walk from the cafe. Call ahead to make a reservation or check to see when they have tours running. It is also fun to go into the town of Los Santos for a few hours. Though the town (or village, rather) doesn’t have too much to offer, it is a nice change of pace, and is a good place to stock up on supplies. You can either take a 15 min bus ride from the hostel, or take the scenic route and walk to town, which takes about an hour. If you happen to have a rest day on the weekend I highly suggest checking out El Mercado Campensino (also called the weekend market). This is a great place to stock up on fruit and vegetables, buy local souvenirs, and try local food. I suggest the arepas. 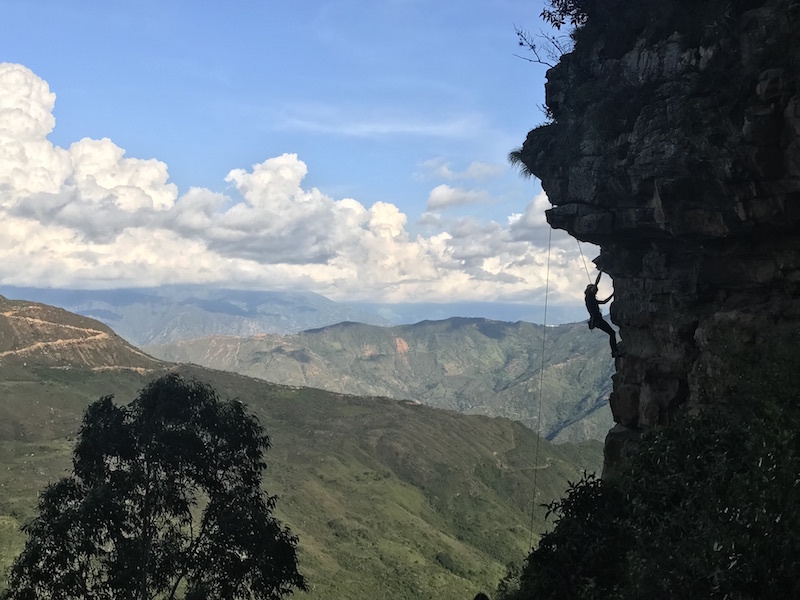 For more reading like this see: “The Top 6 Rock Climbing Towns in South America” and “The Best 3 Places For Rock Climbing Near Medellin, Colombia“.